I asked on Twitter How long have you been working on your commercial game so far? Sub-question: Do you think that’s wise? and you can see the poll results above. 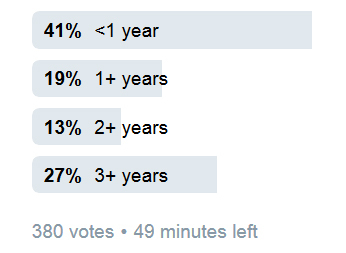 Shockingly (at least I think so), almost a third devs are on 3+ year long projects. 1) I’m working on a short game and it’s nearly ready, so that’s fine. 2) I’ve been working on this game forever and I know it’s not a good idea. 3) I’ve been working on this game forever but it’s part-time and a have a day job so it’s not so bad. It’s common to hear that a game has grossed $X and if that number is big it sounds impressive. But the reality is that, depending on the actual costs to develop that game, it might not have broken even yet, and might not ever do so! – Game has grossed $100K on Steam in first year, wooo! – Steam and taxes eat up 35% so dev receives $65K, still kinda wooo! – Contractors were paid $30K for art/audio and game was exhibited at a show for $5K. – That leaves $30K of “net profit”, which is a bit less wooo. But wait, what about the coder/designer? Well let’s say they spent one year full-time making it, then that’s a salary of $30K (about $14 an hour based on a 40-hour work week). For some people in the world that’s a lot of money but for others it’s really not enough to survive, especially if you have kids eating up the cash like little cash-fueled monsters. What if the game took two years to make? Well then the dev earned less than minimum wage. Your locale may not have have a minimum wage, but here in the UK it is about $10.50 at current exchange rate. What if the game took 3+ years? Yeah it doesn’t look good. Of course some games can have a long tail and when you start to add up the revenue from multiple years, maybe that hourly wage goes up a bit, and that has happened for some of my games. 1) My $100K example above is actually REALLY GOOD. Most games will not make that much money in their first year, only a few good/lucky/promoted ones. So your hourly wage could EASILY be 10x less, or, 100x less. 2) Even if your game does earn $100K gross in year 1, it’s likely to not all occur at launch. (In fact I have another blog post lined up that will go into more detail on this topic.) But the launch might only be $20K, and if you have built up debts whilst making the game, that launch money won’t go very far at all. OK here are three of my games on Steam with the most recent release at the top. Which one do you think has earned me the most $ per hour? The answer, by a mile, is Spooky Bonus. That game has earned me almost $400 an hour but I bet most of you have never even heard of it. Why? Well it took me three months and was a casual portal hit. It was my 7th match-3 game and each time I made a new one I reused the old engine and changed the theme and added some new features. Regency Solitaire took a year, and is my second most profitable game of the above three. I have two other older more profitable games that only took me three months to make (maybe you can see a pattern emerging here). Shadowhand took my wife and I two and half years to make. It’s not a hit but it is selling OK at numbers that many indies would probably be pleased with. In fact it grossed more than the lifetime Steam sales of Regency Solitaire in its first week! Shadowhand also cost more to make than previous games due to all the art, fancy audio, and marketing. Also the revenue is split with a publisher. So as you can guess, the $ per hour rate is currently very low. Now, to be fair, it was only released in Dec 2017 and it will hopefully have a good long tail with lots of sales and discounts etc. which will push up the $ per hour rate. However, even with a decent long tail, Shadowhand is basically NEVER going to match Spooky Bonus for $ per hour. In fact it’s even going to struggle to match Regency Solitaire. That’s why in 2018 I’m focusing on making games a lot quicker. I have a 3 month project lined up and a couple of potential 6 month projects too. Note that quicker doesn’t mean crapper. I already have an existing game engine that I can re-theme and add in new features etc. Also I won’t let quality drop in areas that matter although I do intend to reign in my perfectionism in areas that no one ever notices except me. Also, proud as we are of Shadowhand, it was basically way-overscoped. It takes people about 15-16 hours to beat and many people then play it again on hard mode for another 20+ hours. So it’s super-good value for $15 (buy it!) Too good value in fact. Imagine we had made Shadowhand 1 and 2 and both were 8 hours long? Or Shadowhand was 8 hours long and had 8 hours of DLC? Remember, I’m a full-time indie and I need to earn decent money from my games to support my family of four. So, just please be realistic about your game and don’t fall into the trap of making a giant piece of art that earns you nothing except disappointment. How long have you been working on your game? Is that wise in the current market? Let me know in the comments. You are currently browsing the Grey Alien Games weblog archives	for January, 2018.